Incremental encoders provide a specific number of equally spaced pulses per revolution (PPR) or per inch or millimeter of linear motion. A quadrature encoder is a type of incremental encoder used in many general automation applications where sensing the direction of movement is required. How does a Quadrature Encoder work? The code disk inside a quadrature encoder contains two tracks usually denoted Channel A and Channel B. These tracks or channels are coded ninety electrical degrees out of phase, as indicated in the image below, and this is the key design element that will provide the quadrature encoder its functionality. 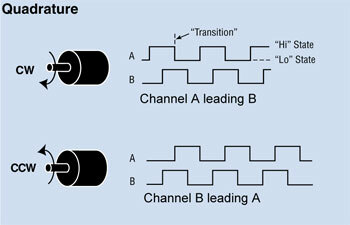 In applications where direction sensing is required, a controller can determine direction of movement based on the phase relationship between Channels A and B. As illustrated in the figure below, when the quadrature encoder is rotating in a clockwise direction its signal will show Channel A leading Channel B, and the reverse will happen when the quadrature encoder rotates counterclockwise. Apart from direction, position can also be monitored with a quadrature encoder by producing another signal known as the “marker”, “index” or “Z channel”. This Z signal, produced once per complete revolution of the quadrature encoder, is often used to locate a specific position during a 360° revolution. When to use Quadrature Encoders? Quadrature encoders are used in bidirectional position sensing and length measuring applications. However, in some unidirectional start-stop applications, it is important to have bidirectional information (Channel A & B) even if reverse rotation of the shaft is not anticipated. An error in count could occur with a single-channel encoder due to machine vibration inherent in the system. For example, an error in count may occur with a single-channel encoder in a start/stop application if it mechanically stops rotating when the output waveform is in transition. As subsequent mechanical shaft vibration forces the output back and forth across the edge the counter will up-count with each transition, even though the system is virtually stopped. By utilizing a quadrature encoder, the counter monitors the transition in its relationship to the state of the opposite channel, and can generate reliable position information. When more resolution is needed, it is possible for the counter to count the leading and trailing edges of the quadrature encoder’s pulse train from one channel, which doubles (x2) the number of pulses per revolution. Counting both leading and trailing edges of both channels of a quadrature encoder will quadruple (x4) the number of pulses per revolution. As a result, 10,000 pulses per turn can be generated from a 2,500 PPR quadrature encoder. Typically with a Dynapar encoder, this 4x signal will be accurate to better than ±1 count. How to choose a Quadrature Encoder? 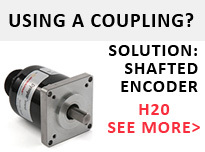 Like all encoders, choosing a quadrature encoder starts with your application. 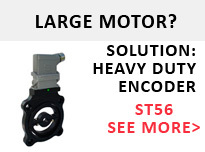 If your motor has a shaft, a shafted encoder with a coupler can be used. 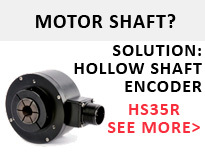 A hollow shaft encoder is another option mounted with the motor shaft going through the encoder for more accuracy. If your motor is used in a contaminated or dirty environment or you are using a large vector motor, a bearingless or magnetic encoder will provide the most reliable feedback.